Not to be confused with the 2nd century Roman saint Peregrine (martyr). Peregrine Laziosi was born around 1260, the only son of an affluent family in Forlì, in northern Italy. At that time Forli was part of the Papal States. Peregrine's family supported the anti-papal faction. In 1283 the residents of Forlì were under interdict. St. Philip Benizi, Prior General of the Friar Servants of Saint Mary, was sent to try to reconcile the divided community. 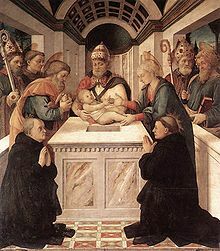 While trying to preach in Forlì, Philip was heckled and struck by the eighteen-year-old Peregrine. He was driven from the city with insults and violence. Peregrine repented and asked Philip for forgiveness. St. Philip received him with kindness. The moment had a profound effect on Peregrine. Filled with remorse, he began to pray more and to channel his energies into good works. A few years later, he joined the Servites in Siena and went on to be ordained a priest. After some years he was sent back to Forlì, where he founded a new Servite house there and became well known for his preaching and holiness as well as his devotion to the sick and poor. It is said that he miraculously multiplied grain and wine during a severe shortage in his area. People took to calling him the "Angel of Good Counsel," so grateful were they for his wise advice so freely given. One of the special penances he imposed on himself was to stand whenever it was not necessary to sit. When tired he would support himself on a choir stall. At the age of sixty he developed an infection in his right leg. His condition deteriorated to the point that the physician decided to amputate his leg. The night before the operation Peregrine spent time praying before a fresco of the Crucifixion in the chapter room. He fell into a deep trance-like sleep and seemed to see Jesus descend from the cross to touch his leg. The following day, the doctor arrived to perform the amputation and finding no sign of the cancer, spread news of the miraculous cure throughout the town. This only increased the people’s regard for Peregrine. 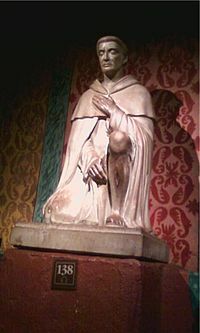 The saint died of a fever on May 1, 1345 at the age of eighty five. An extraordinary number of people from the town and countryside honored him in death. Some of the sick who came were healed through his intercession. His body rests in the Servite church of Forlì, the Basilica of Saint Pellegrino Laziosi. Pope Paul V declared him blessed in 1609 and Pope Benedict XIII canonized him in 1726. The liturgical feast of Saint Pellegrino/Peregrine is on May 1. According to some, the lesson of Peregrine’s life is not that God worked a miracle, but that a faithful servant placed himself, unconditionally, in the hands of God. Peregrine’s trust in God therefore serves as a model for those dealing with sickness. However, his recovery has been cited as an example of the potency of the immune system in fighting cancer. ^ Cann SH, Van Netten JP, Van Netten C. Dr William Coley and tumour regression: a place in history or in her the future. Postgraduate medical journal. 2003 Dec 1;79(938):672-80.